The aim of this study was to estimate genetic parameters of some carcass characteristics in the Japanese quail. For this aim, carcass weight (Cw), breast weight (Bw), leg weight (Lw), abdominal fat weight (AFw), carcass yield (CP), breast percentage (BP), leg percentage (LP) and abdominal fat percentage (AFP) were measured on approximately 500 quails (offspring of 60 sires and 180 dams). Gibbs sampling (GS) under a multi-trait animal model was applied to estimate heritability and genetic correlations. Genetic analyses were performed using MTGSAM (Multiple Trait Gibbs Sampling) software. Heritability estimates for all the traits were low to moderate. Point estimates (means of marginal posterior densities) of heritabilities for Cw, Bw, Lw, AFw and CP, BP, LP, AFP were 0.42, 0.36, 0.34, 0.40 and 0.11, 0.18, 0.12, 0.29, respectively. Genetic correlations between the carcass parts (Cw, Bw, Lw, AFw) were high and positive, ranging from 0.65 to 0.87. Direct selection for total carcass weight would increase its component traits. There were moderate to high negative genetic relationships between AFP and LP (-0.27), AFP and BP (-0.34), and AFP and CP (-0.89). Therefore, a decreasing AFP in quail could be reached by direct selection for higher CP. Japanese quail, despite their small body size, have an important place in commercial production because of their high egg and meat production capacity. Quails are generally reared for egg production in the Far East and Asian countries, and primarily for meat production in European and American countries (Minvielle, 2004). In certain countries such as Turkey, quails are raised for meat production and marketed by being priced per animal. This limits the genetic evaluation studies on live-weight. In addition, many producers want to obtain heavier quails since small quails are not preferred by consumers, which extend the rearing period. However, it has been confirmed that most of the weight increases are due to abdominal fat deposition when the optimal slaughtering age of the Japanese quail is exceeded (Toelle et al., 1991). This situation causes significant economic losses to producers and results in lesser quality products for consumers. However, it is possible to attain positive results in a short period of time by applying suitable breeding strategies to increase carcass weight and quality. The results of previous studies indicated that selection for live-weight also increased carcass weight (Caron et al., 1990; Marks, 1990; Oguz & Turkmut, 1999; Oguz, 2005). Estimates of genetic parameters for slaughter and carcass traits of quails were reported by Kawahara & Satto (1976), Toelle et al. (1991), Aksit et al. (2003) and Vali et al. (2005). Heritability estimates for eviscerated weight, and carcass, carcass fragments and abdominal fat weights were generally found to be high and medium in the reported studies. Toelle et al. (1991) determined a high genetic correlation between eviscerated weight and breast weight, and similarly, Vali et al. 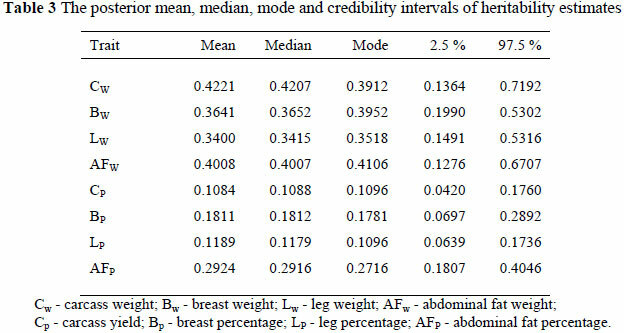 (2005) reported high genetic correlations between eviscerated weight and leg weight. 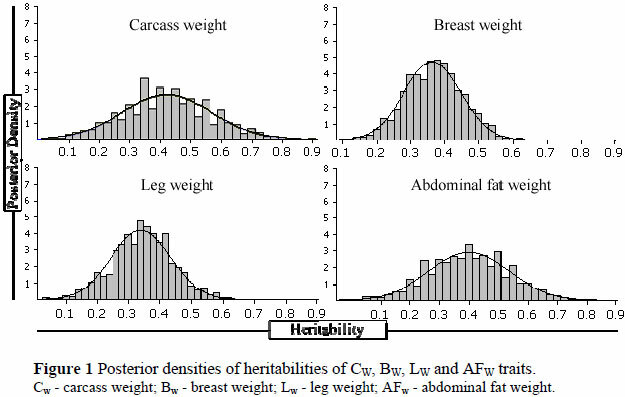 Additionally, there is a rather high genetic correlation between abdominal fat and carcass yield in poultry (Gaya et al., 2006). Live-weights at fixed ages were used as selection criteria in most of the genetic evaluation studies carried out to increase meat production in the Japanese quail (Darden & Marks, 1988; Caron et al., 1990; Turkmut et al., 1999). In a few investigations feed conversion ratio, carcass traits and growth curves were studied (Pym et al., 1998; Narinc et al., 2010). In the studies performed on Japanese quail, lines with increased meat production of 300% and egg yields of 200% were developed (Minvielle, 2004). However, certain correlated traits were improved for meat production or egg yield in dam and sire lines, and modern poultry breeding techniques for commercial use of crossbred hybrids of these lines have not been used. Therefore, certain disadvantages such as reduced fertile egg production and feed conversion ratio, and deteriorated egg quality occurred in future generations due to the rapid increase in live-weight and egg yield (Minvielle, 2004). In a successful breeding study, genetic parameters of the selected traits should be correctly estimated and suitable breeding programmes should be planned. In the present study, the objective was to determine descriptive values of the studied traits and their heritability, and genetic correlations between carcass traits of the Japanese quail. An experiment was carried out in a curtained quail coop located at the Research and Application Unit in Department of Animal Science, Faculty of Agriculture, Akdeniz University. The management and handling of the birds were performed according to the practices as required by the Akdeniz University. Data pertaining to the properties of the carcass, carcass parts, edible innards and abdominal fat samples collected from ca. 500 quails were used. Quails with production records were obtained from 60 families and composed of 60 male and 180 female quails. No selection study was performed on the parents, and females and males were randomly distributed during the development of the families. Females were kept in individual cages. To obtain a high fertility, males were relocated every day in the families consisting of three females and one male. Hatched chicks were marked with numbered wingbands and were placed in growth cages. Three weeks later, randomly selected birds were placed into feeding cages. In the first three weeks, the birds were fed a starter diet containing 240 g CP and 12.1 MJ ME/kg feed ad libitum, and between 3 - 6 weeks a diet containing 200 g CP and 11.7 MJ ME/kg feed. At six weeks of age the birds were sent to a slaughterhouse. After weighing each quail, they were killed by hand and their blood was drained, and procedures including wet plucking and evisceration were applied by hand. Subsequently, the weights of the carcasses (Cw), abdominal fat (AFw) and carcass parts, the breast (Bw) and leg (Lw), were determined. The Cw and AFw were divided by the eviscerated weight so that carcass yield (CP) and abdominal fat percentage (AFP) could be calculated. Similarly, Bw and Lw were divided by carcass weight, and breast percentage (BP) and leg percentage (LP) traits were obtained. In the analysis of data, a complicated linear model, shown as y = Xβ+Zu+e, was used. In Gibbs sampling, uniform prior was used as prior distribution for fixed effects, and random effects were assumed to show multivariate normal distribution. Gibbs modelling, which is a strong iterative algorithm for the investigation of posterior distributions, produces sample values for common posterior density distribution of all the parameters in the model by sampling all the conditional distributions, respectively. For this purpose, a random initial value was given to each variable (β, u, G, R), respectively, and a Markov chain was formed when a circle was completed by updating each variable with regard to their previous values (Firat, 1996). This process was repeated 25000 times for each trait, and marginal posterior distributions were obtained from one long chain. During the process, the burn-in part which was the initial 2500 of Gibbs chains were removed. Subsequently, the thinning interval value was accepted as 20 for the thinning process considering the effective independent sample sizes, time interval of which was calculated using auto-covariations in the rest of the chain. Gibbs sampling was carried out using MTGSAM software (Van Tassell & Van Vleck, 1995). The descriptive statistics for studied traits are presented in Table 1. Heritability and genetic correlation estimates for Bw, Lw, AFw and CP, BP, LP, AFP traits using Gibbs sampling are given in Table 2. Posterior means estimated using Gibbs sampling, mode, median and confidence intervals are given Table 3. Heritabilities for CP, Bw, Lw, AFw traits were estimated at moderate-high levels to be 0.42, 0.36, 0.34 and 0.40, respectively. Heritability estimates of eviscerated and carcass weights of poultry were reported as generally moderate and high by various researchers (Toelle et al., 1991; Gaya et al., 2006). Heritability estimates of CP, BP, LP, AFP traits were estimated as low-moderate, viz. 0.11, 0.18, 0.12 and 0.29, respectively. 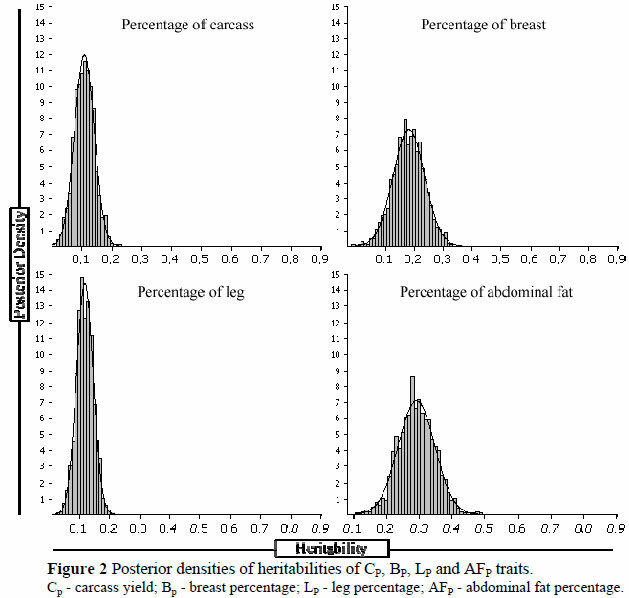 Heritability estimates of the mentioned traits and posterior density graphics are given in Figure1. Similar to the high heritability estimated for Cw trait in the study, Aksit et al. (2003) reported this parameter for quails slaughtered at 35 days of age as 0.59, using variance components, and 0.71 using an animal model. However, Vali et al. (2005) determined Cw a lower heritability (0.27) for the quails slaughtered at 49 days of age. In the present study, genetic correlations between the Cw-Bw and Cw-Lw traits were determined as 0.87 and 0.79, respectively. 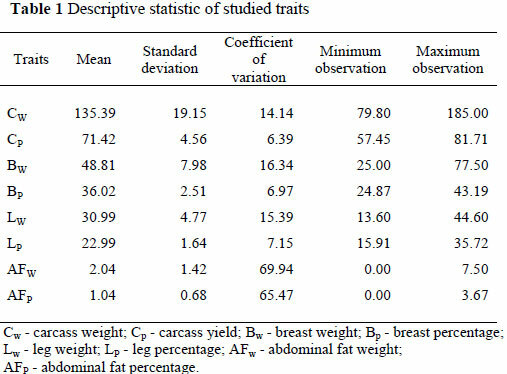 Similarly, genetic correlation between carcass weight and breast weight reported by various researchers ranged between 0.88 and 0.99, and genetic correlations between carcass weight and leg weight ranged within the interval of 0.71 - 0.96 (Aksit et al., 2003; Vali et al., 2005). In the present study, heritability determined for CP trait was found comparable with a value of 0.11 reported by Vali et al. (2005), and lower than 0.18 (animal model) and 0.25 (variance component estimation) reported by Aksit et al. (2003). Genetic correlations between CP-BP and CP-LP were estimated to be 0.27 and 0.47, respectively. The heritability for the BP trait was estimated as 0.18 in this study. This finding was found comparable with the results reported by the researchers who estimated heritability for proportional breast weight of quails. Heritability for the mentioned trait was determined to be 0.18 - 0.19 by Aksit et al. (2003) and 0.15 by Vali et al. (2005). The heritability estimate for LP was 0.12 in the study, and was lower than the estimates (0.19 - 0.42) reported by various researchers for the same trait (Toelle et al., 1991; Aksit et al., 2003; Vali et al., 2005). A negative genetic correlation was determined between BP-LP traits, which indicates that the selection for Bw trait would cause increases in LP trait. The heritability (0.40) for AFw estimated in the study was found to be high, with mean levels similar to the findings (0.30 - 0.45) reported by Toelle et al. (1991) and Aksit et al. (2003). Genetic correlations between AFw and Cw, Bw, Lw were positive and high. These results were comparable with the estimates of genetic correlations between abdominal fat weight and carcass, breast and leg weights (Aksit et al., 2003). Heritability for AFP trait was estimated to be 0.29 in the study. Similarly, Aksit et al. (2003) determined the heritability for the AFP trait as 0.23 using the variance components method, and 0.25 with the animal model. In the present study genetic correlations between AFP and CP, BP, LP traits were negative, viz. -0.89, -0.34 and -0.27, respectively. In conclusion, when the CP trait was used as selection criterion instead of the Cw trait, AFP was expected to be reduced due to the negative correlation between them. Successful results could be obtained with the selection applications by determining breeding values with multiple traits and certain traits such as feed consumption, feed conversion ratio and fertility which were not determined in the study. This study is part of the MSc thesis of the first author. The research with the project number of 2005.02.0121.005 was supported by the Akdeniz University Scientific Research Projects Management Unit.